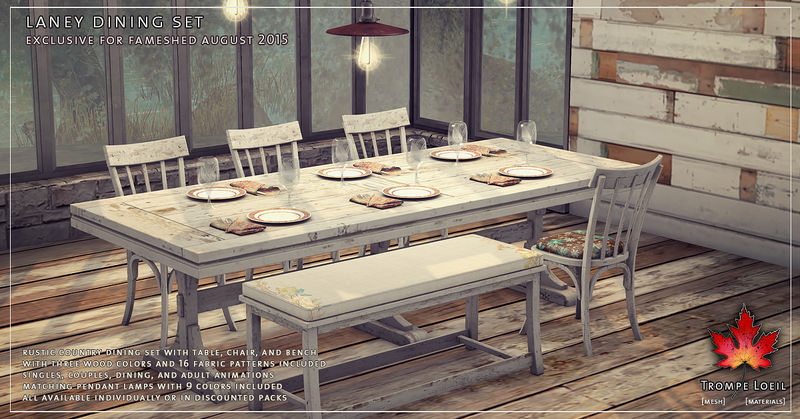 Enjoy rustic country style in the dining room! 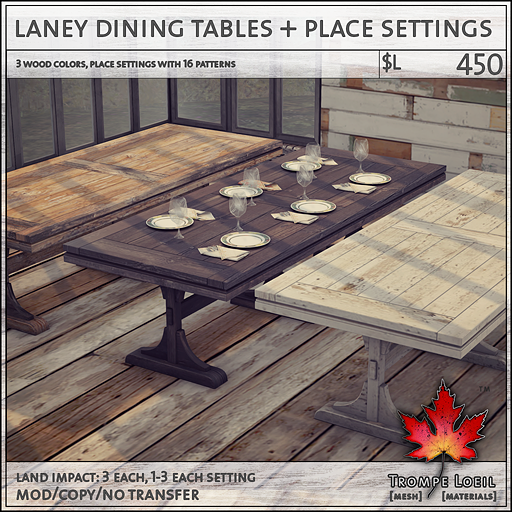 Trompe Loeil’s new Laney Dining Set includes three versatile wood finishes, 16 worn and wonderful fabric options, tons of single, couple, dining, and adult animation choices with props, and matching pendant lamps in 9 metal colors – all available individually or as discounted packs – only at FaMESHed‘s August round! 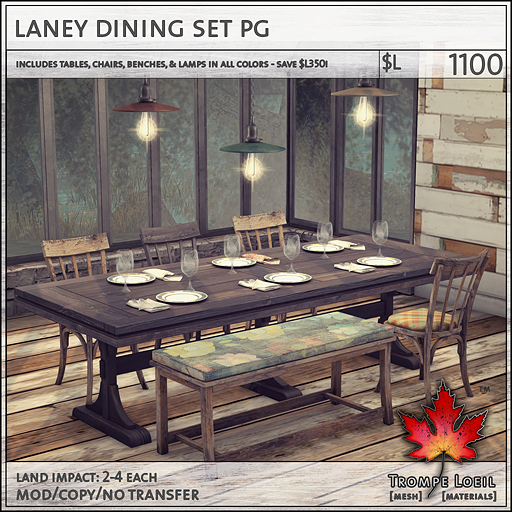 The Laney Dining Tables & Place Settings are the centerpiece of your country kitchen or dining room. 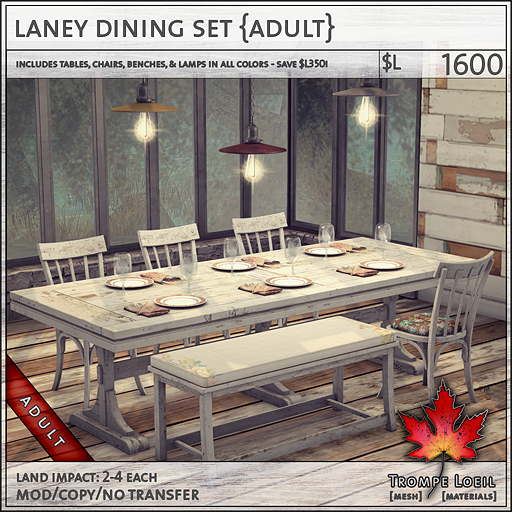 We include white, natural, and dark wood finishes in a lovely shaker-style table, and the place settings are versatile with multiple options including low and high LOD flatware models, napkin and plate sets, and 16 lovely patterns that match the seating sold separately. 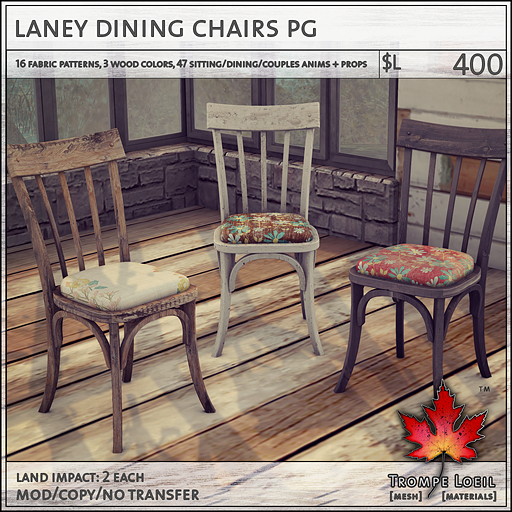 The Laney Dining Chairs also include the three coordinating wood colors, and 16 lovely worn fabrics in a variety of colors and patterns for the seat. 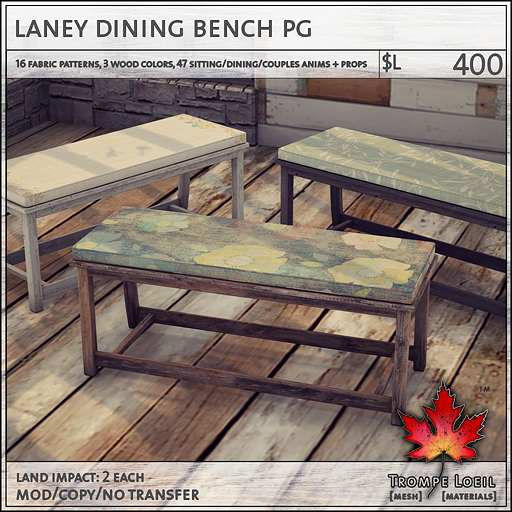 Keep it unified or mix and match for a homey look – and choose from PG or Adult versions, both of which include dining animations and attachable props! 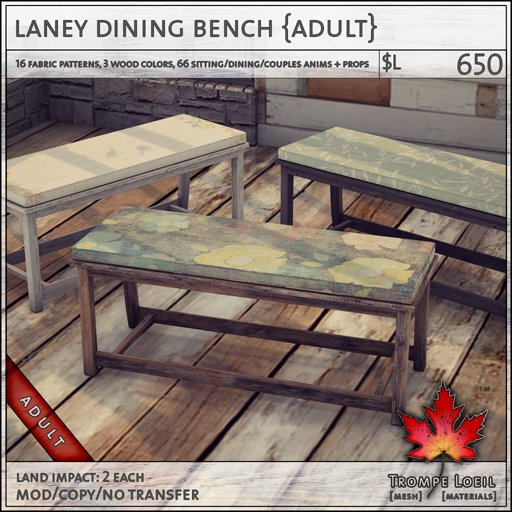 The Laney Dining Bench features the same lovely wood finishes, animation options, and patterns as the Laney Dining Chairs, but includes space for a second person to sit and dine! Need a gorgeous and thematic light? 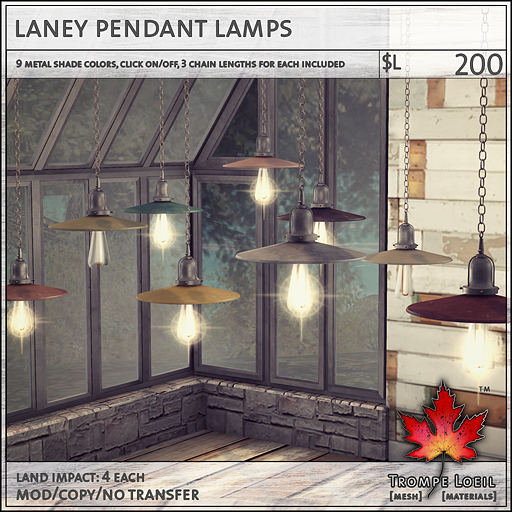 The Laney Pendant Lamps include 8 fashionable metal colors (plus 1 unpainted metal finish) and a retro lightbulb that turns on and off with a touch, with hardware lighting, glow, and halo effect. 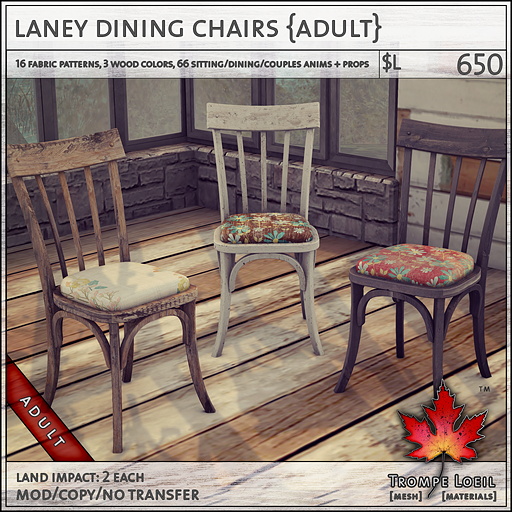 We include three chain lengths for each color to make decorating a breeze! 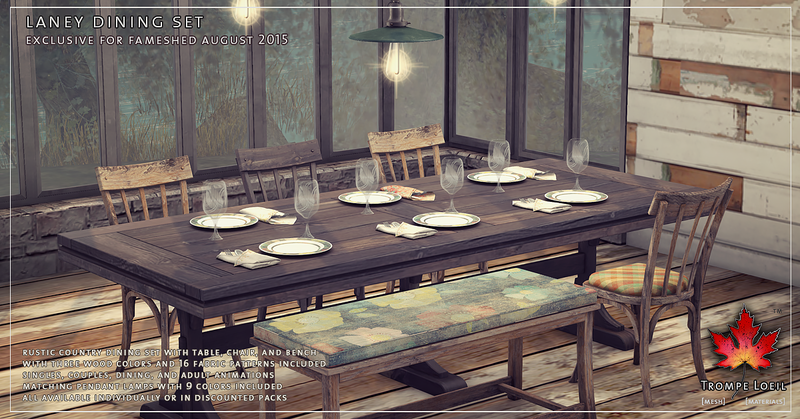 As always, take advantage of our discounted packs – get it all and save!